Comedian and now writer/director Bo Burnham has created one of the most realistic and relatable films of the year so far. His directorial debut “Eighth Grade” is an outstanding achievement, ranking it up with the levels of Barry Jenkins’s “Moonlight” and Greta Gerwig’s “Lady Bird”. Elsie Fisher stars as Kayla, a shy Eighth grader who desires to make friends and survive the rest of her final year in middle school before moving on to high school. Through this, she learns the importance of being yourself, and more importantly about the process of growing up. Things can seem hopeless at that age, but once you get to know people and put yourself out there, its not as bad as it seems. The film is beautiful in its own quirky little way. Its level of realism takes audiences right into Kayla’s life, and makes us empathetic through her character. She of course, goes through many ups and downs, just as any eighth grader does. Kayla experiences loads of anxiety and sadness, while also being an incredibly positive and lovable person. She gets nervous at pool parties, likes the stereotypical “bad boy” but cant seem to talk to him, and is constantly embarrassed by her father’s love for her. What kind of eighth grader doesn’t go through that type of stuff? Elsie Fisher (fun fact: the voice of the youngest girl in “Despicable Me”) gives a relatable performance as Kayla, which will surely put her on the map for more indie films like this one. She conveys her character very well and delivers one of the finest young performances in recent years. Her performance is right up there with young performances like Jacob Trembly in “Room”, Milly Shapiro in “Hereditary” and Brooklyn Prince in “The Florida Project”. Burnham’s debut is undoubtably funny and heartfelt from start to finish, with plenty of emotion and heartbreak thrown in the mix. Its screenplay is superbly well written by Bo Burnham, making for an excellent story, in addition to being an observational film that relies on realism more than plot. “Eighth Grade” is easily comparable to films like “Lady Bird” and “Moonlight”, both of which are coming of age stories produced by A24. The quality of Bo Burnham’s “Eighth Grade” is right up there with those recent masterpieces. “Eighth Grade” is one of the most well-constructed movies of the year so far, with its impeccable direction and whimsical score. The performances have some clear talent behind them, and the finely directed central performance is enough of a reason to give the film some award recognition. This sweet little coming of age story has a lot to it, but what’s most important to know is that it’ll give you all the feels. 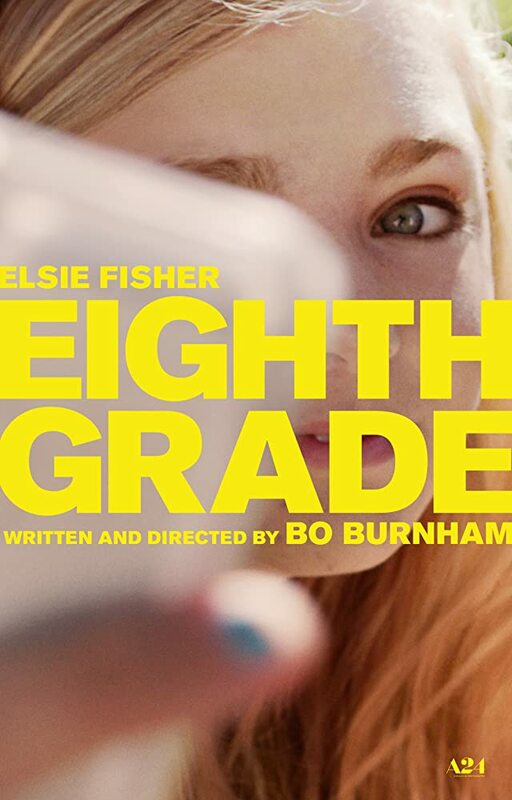 Just as Elsie experiences the ups and downs of eighth grade, so do we. The entire film is quite touching, and it will definitely make you smile.